Buzzing, interesting, and three floors of fun — Gilly’s Redefined is everything like your favourite Gilly’s but also so much more. Koramangala folks, this one is for you. 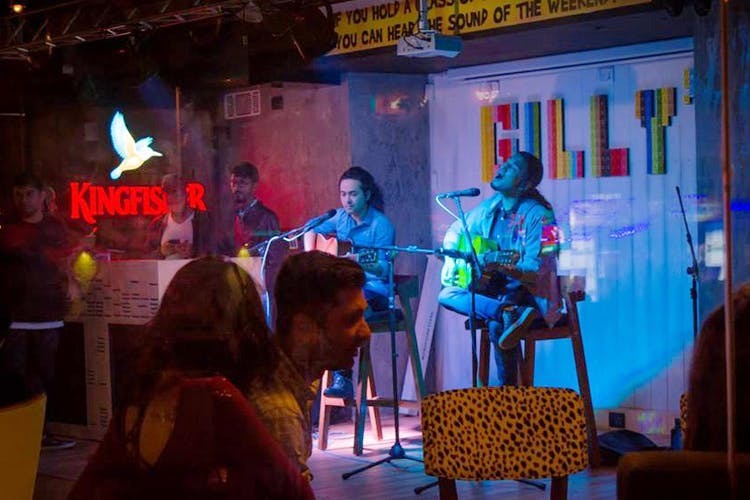 Quote us if you will, but we feel the massive three-floored complex of Gilly’s Redefined is Koramangala’s answer to Indiranagar’s music meets sangria space, The Humming Tree. The complex catches your attention with its mural work on the walls. Enter through the tunnel of lights and you’ll be welcomed to the open-air garden space of Myu Bar. Perfect space to enjoy the nip in the air with a pint of beer, we say although the music is somewhat drowned by the traffic outside. Nonetheless, you have the al fresco seating on the ground floor where you can smoke away and listen to everything from retro to current. Pop-culture artwork on the walls rub off well with the millennial us and oh, they do make perfect spots to take selfies. Inside the seating space is a mix of bar stools, high chairs, plush chairs, and diner-style booths. Coming in with a large group? Then stick to the booths and the long tables. There’s a 7 plus seater space in one corner with the Central Perk logo painted on the wall behind it. The live performance space on the first floor and there's terrace seating too! When you have got things like Desi Aloo Fry, Asian BBQ Chicken Wings, and Ghee Roast Prawns, you know you are sorted in the food department. Start off with the Scamorza Stuffed Cheesy Mushrooms before getting your hands all dirty with the saucy and spicy Asian BBQ Wings. Not a fan of wings? Well, there’s always the Ghee Roast Prawns and the Wok Tossed Chilli Basil Fish for you. Algerian Grilled Chicken served with Cilantro and Tequila Cream is another one for the table. Whether you are coming for an after work drink scenes or for weekend shenanigans, the starter section is enough to keep you going through the night. Speaking of the drinks, it’s the usual fare with some signature cocktails like Hell To Heaven and English Monsoon. While we didn’t order from the signature selection, we stuck to some safe choices and ordered a Mai Tai, Long Island Iced Tea and an Istanbul Long Island Iced Tea. To say the least, the winner of the night was the Istanbul, with the Mai Tai a bit too strong for us. The place’s ambience certainly is a winner with us and the food and drinks are easy on the pocket too. We are waiting just waiting for the rest of the space to open up.